Mariners are reminded that only the whip VHF aerial of the sunken vessel is visible at high water. 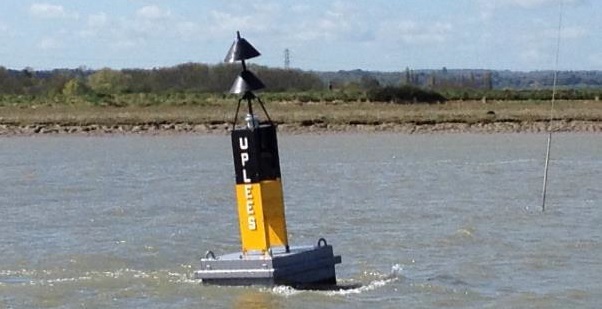 The two yellow pellet buoys previously used to mark the wreck have now been removed. Dover Marina as part of its open day on Saturday 16 May have arranged a “Flare Amnesty.” Private individuals can take flares along to Dover Marina between 11am and 2pm and dispose of them free of charge. Entry to the open day, which runs from 9am to 5pm, and car parking is also free on the day. There will be some charitable collection boxes on hand and they hope that people will put in a small donation. Apparently, Peter Thurston, 81, made his “catamavan” because he could not afford a cabin cruiser. He owns some small yachts – but says they are too cramped to give him a comfortable view. So the agile sailor built the hull of a catamaran and bolted an old four-berth caravan on the top and says he now really feels at home on the water. Queenborough Harbour has vacancies for “deckhands” both full time and casual to join the growing team. The season is starting, so bring your lifejackets along to Gillingham Marina’s Safety Weekend for a free check by the RNLI.